The Brod Law Firm's personal injury lawyers in Bala Cynwyd, Lower Merion Township accept cases wherein victims sustain injuries as a result of negligence on the part of another. If it can be proven that the victim sustained injuries because of negligence on the part of the defendant, the victim is entitled to monetary compensation. Simply stated, our goal is to get the injured personal injury victim the best result possible. Our Bala Cynwyd personal injury lawyers are very convenient to many areas, the Main Line, i.e Merion, Merion Station, Haverford, Upper Darby and Havertown as we are close to City line Avenue and approximately one mile from Route 76 (Schuylkill Expressway) We are very convenient to the Philadelphia areas of Manyunk, Roxborough, East Falls, Overbrook Park and West Philadelphia. Why Choose Bala Cynwyd Personal Injury Attorney Gary Brod? Commonly called a "slip and fall" case, these instances cause personal injury when a person slips, falls or trips on a surface. The Brod Law Firm personal injury attorneys represent Bala Cynwyd, Pennsylvania area clients in these types of cases when the slip and fall was the result of negligence on the part of a property owner or manager. In most successful slip and fall cases, the victim falls because the surface is unexpectedly slick or irregular. If this unsafe surface was preventable, a negligent property owner may be liable for the injuries the victim sustained. Common injuries sustained during slip and fall cases include minor bruising and broken bones to major back, neck and head injuries. If you or a loved one was a victim of unsafe conditions, The Brod Law Firm encourages you to contact our personal injury lawyers in Bala Cynwyd today! Each year, The Brod Law Firm personal injury attorneys help Pennsylvania victims receive compensation for physical and mental injuries. 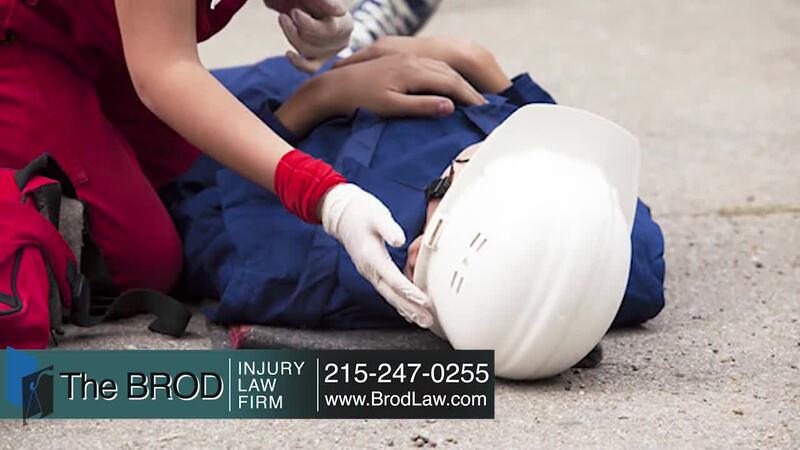 If you would like information from an experienced Norristown Slip and Fall Lawyer, please contact the Brod Law Firm online or call for an immediate Free Case Consultation. For a claim to be successful, it is important to determine whether or not the property owner or manager was negligent. The Brod Law Firm prides itself on the expert case assessments provided by our personal injury attorneys in Bala Cynwyd. Pennsylvania courts often consider whether or not the owner knew about the unsafe conditions, how long he or she was aware of the problem and whether or not the owner took the necessary steps to rectify the problem. That is why our personal injury lawyers help Bala Cynwyd area clients in gathering evidence. Injuries sustained in elevator accidents are often severe and even fatal. Because many elevator accidents involve the victim falling from great heights, these injuries can be extremely serious. If you or a loved one was a victim of unsafe conditions, The Brod Law Firm encourages you to contact our personal injury lawyers today. Each year, The Brod Law Firm personal injury attorneys help Bala Cynwd, Pennsylvania injured victims receive compensation for physical and mental injuries. Because of the heights and extreme conditions that construction workers are subjected to, accidents occur daily. Often, construction workers suffer severe injuries after cranes, bridges or scaffolding collapse. Our personal injury lawyers in Bala Cynwd often hear reports of faulty structures and products collapsing even after property owners were made aware of potential danger. In these cases, the property owner or manager can be held liable for negligence and the victim can be awarded damages for the personal injury claim. For a claim to be successful, it is important to determine whether or not the property owner or manager was negligent. The Brod Law Firm prides itself on our expert case assessments provided by our personal injury attorneys in Bala Cynwyd. Pennsylvania courts often consider whether or not the owner knew about the unsafe conditions, how long he or she was aware of the problem and whether or not the owner took the necessary steps to rectify the problem. That is why our personal injury lawyers help Bala Cynwyd victims injured in Scaffolding and Building collapses in gathering evidence. Injuries sustained in scaffolding, bridge and crane collapse accidents are often severe and even fatal. Because many construction site accidents in Pennsylvania involve the victim falling from great heights, these injuries can be extremely serious. If you or a loved one was a victim of unsafe conditions, The Brod Law Firm encourages you to contact our personal injury lawyers today! Each year, The Brod Law Firm personal injury attorneys help Bala Cynwyd area, Pennsylvania area victims receive compensation for physical and mental injuries. Contact our personal injury attorneys in Bala Cynwyd, Pennsylvania to schedule a consultation today. Despite strict safety regulations and federal control, America has the highest rate of airplane crashes in the world. This can be attributed to heavy air traffic and the tightening of airline budgets since the disaster of September 11th. Often, airplane crashes are the result of the mechanical failure of the plane or the misjudgment of the pilot or airport crew. In airplane crashes, victims or their survivors can seek damages against an airline if it can be proven that the airline was negligent. At The Brod Law Firm, our personal injury attorneys in Bala Cynwyd, Pennsylvania have successfully litigated and settled many aviation cases. Injuries and fatalities sustained during plane crashes are often the result of faulty mechanics or human error. Because many airlines are seeking to cut costs, maintenance and expert staffing maybe be suffering. If you or a loved one was a victim of unsafe conditions, The Brod Law Firm encourages you to contact our personal injury lawyers in Bala Cynwyd today! Each year, The Brod Law Firm personal injury attorneys help Pennsylvania victims receive compensation for physical and mental injuries. While pets can be a great joy, if they are not properly managed, they can cause a great deal of damage. For victims who have been attacked by a vicious dog or pet, these attacks can cause severe injuries, disfigurement and mental pain and suffering. At The Brod Law Firm, we take pride in the expertise and litigation experience of our personal injury attorneys. Our Bala Cynwyd, Pennsylvania area clients who have been injured by a vicious animal are encouraged to call The Brod Law Firm today. We have successfully handled over 209 dog bite cases. There are several factors that can contribute to the assumed negligence of a pet owner, and all of these factors will be considered by our personal injury attorneys. Pennsylvania courts often consider the following factors: First, did the animal have a history of violent behavior? If a pet owner is aware of a pet's tendency to attack, the owner has a duty to contain the animal. Despite this consideration, however, our personal injury attorneys have helped Bala Cynwyd, Pennsylvania clients to receive damages in animal attack cases even if the pet has had no prior history of aggression. Also, did the pet owner do everything in his or her power to contain the animal, even if it did not have a history of attacking? By having prior knowledge and evidence to support the owner's negligence, an animal attack case will be considerably stronger. If you or a loved one was a victim of an animal attack, The Brod Law Firm encourages you to contact our dog bite lawyers in Bala Cynwyd today! Each year, The Brod Law Firm personal injury attorneys help Pennsylvania victims receive compensation for physical and mental injuries. What should I do if I believe I have a Bala Cynwyd Personal Injury Case? Our personal injury lawyers recommend Bala Cynwyd personal injury victims take several important steps if you believe that you have been injured because of the negligence of others. First, document the incident. What happened? How did it happen? Did you ever warn the defendant that he or she was being negligent? Next, take pictures of any injuries you may have suffered. Our personal injury attorneys in the Bala Cynwyd also recommend that you take pictures directly after receiving injuries to show the extent to which you or your loved one suffered. At The Brod Law Firm our personal injury attorneys work for victim's rights. Contact The top rated Brod Law Firm today to speak to one of our experienced personal injury lawyers in Bala Cynwyd. Call Gary Brod anytime at 888-435-7946 (888-HELPWIN) for a free no obligation consultation and explanation of your legal rights. We also have the option of easy online or phone sign-up process and we can begin work today.